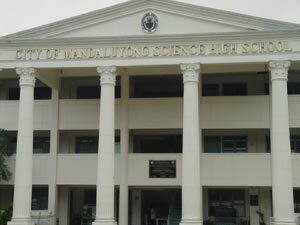 The City of Mandaluyong Science High School (CMSHS) was the brain child of Hon. Neptali“ boyet” M. Gonzales II, Representative, lone district of the City of Mandaluyong borne out of necessity - the need to give quality public secondary education that will nurture the best students of the city. His lofty dream had transformed into reality during the Ground Breaking Ceremonies on March 15, 1996 at the back of the Jolo, now Hulo Elementary School compound, E. Pantaleon Street before Noah’s Ark Sugar Refinery in Barangy Hulo, Mandaluyong City. Thus,the school was founded through the collaborative efforts of Rep. Neptali “Boyet” Gonzales II,senate President Neptali A. Gonzales,Sr., then city Mayor Benjamin S. Abalos,Sr., the city council of former school division superintendent and Mandaluyong, Dr. Pedro A. Ramos, supervisor in science and health who was appointed officer-in-charge (OIC) Dr. Emelita D. Magsalin, education. Likewise 13 pioneering teachers were selected to start classes in June 1996 using the Special Science and Technology curriculum,to an enrolment of 144 students who passed the written and oral examination conducted by the education super visors of the City Schools of Mandaluyong. The old six rooms Grade VI Building of Jolo Elementary School served as the first classrooms, administrative office/faculty room and canteen. On February 12, 1998, President Fidel V. Ramos signed into law, House Bill 7492 authored by Rep. Neptali “ boyet” Gonzales II,thus Republic act no. 8497 was born enacting that a science high school be established at barangay Hulo, City Mandaluyong and appropriating funds therefore. The completion of the water reservoir and toilet facilities ensued, followed by the façade, basketball court, and lastly, the landscaping, with the arrival of the new sets of computers and construction of the speech laboratory sponsored by Eduardo Cojuangco. The unveiling of the CMSHS marker took place on August 30, 1999 with His Excellency, Joseph E. Estrada, President of the republic of the Philippines as the Guest Honor.President Estrada was joined by House Speaker Manuel Villar, DECS Secretary Andrew Gonzales, Press Secretary Gerry Barican, Majority Floor Leader Manuel A. Roxas II, Tourism Undersecretary Ram Antonio And Presidential son JV Ejercito, founders of the school and constituents of the city during this special event. Natural, environmental and human resources must be saved, protected, conserved and developed fort today and the generations to come; and -One’s knowledge and talents bring real happiness if shared and applied positively and selflessly.